During the summer of 1998 I completed 20 American Flag Kits. What fascinates me about flags (and this goes for any country’s flag) is the object itself is nothing but colored cloth arranged into a snappy design. It is human investment that gives the banner power. Wandering meaning is an essential part of a flag’s make-up for a flag is basically a blank. Its meaning is determined by various elements including an individual’s ideology, the government in power, and one’s own personal history. In the U.S., the flag represents democracy and the nature of democracy is that it can be reconfigured as long as a majority of the people is in agreement. I thought an American Flag Kit would be a great way to represent the American flag. I chose gray archival cardboard and rubber bands as materials. Gray is a good starting color for a country so torn between black and white and the rubber bands communicate a design that can be re-shaped in a snap. The Internet supplied the ratios for the official American flag dimensions. I didn’t want the flag to be too big or too small and I wanted the kit to be an accessible package that could easily be transported or stored. I settled on a 21” Union and a 75” length. A traditional American flag measuring close to the official ratios can be assembled using the kit. Each kit contains a Union, 39 pre-punched 3” wide stripes, a ruler, scissors, 4 bags of rubber bands and instructions. Every visual choice I made in creating these kits was a considered aesthetic decision. It took me a long time to figure out how the kit would be packaged. Eventually I found a cardboard box that met my size requirements and I chose rubber stamps for the logo. The stamp is a cheap practical method for a small one-person business. “The American Flag Kit” font is Arial, a “plain jane” typeface. Stamped on the tops and sides of each box, striking the alert of FRAGILE-HANDLE WITH CARE, is the advice to Assemble Collectively. The Styrofoam “peanuts” I used for packing are white with a few colored ones added. The Union has no pre-punched holes simply because it looks better lying in the box without them. The kits are all hand made, every section hand cut; this lends a sense of insanity to the project. When exhibited the kits are displayed as merchandise, stacked and ready to go. Since creating the kits I have exhibited them twice. The first time was in a 1998 group show titled ”no boundaries” at Trans Hudson Gallery in New York. The second time was in a two-person 1999 exhibition with artist Matthew Swift titled “24 Hours of Cable” at New York University’s Rosenberg Gallery. Though I was pleased with both exhibitions, the flag kits remain an incomplete project. I always intended to exhibit the kits in different locations and include a card in each box asking the owner(s) to mail an image of the assembled flag. This project is considered complete when an exhibit of the assembled flags takes place. 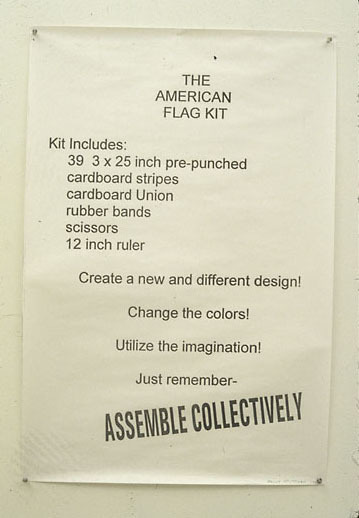 The idea for “An American Flag: Democracy in Action” grew out of the American Flag Kits. 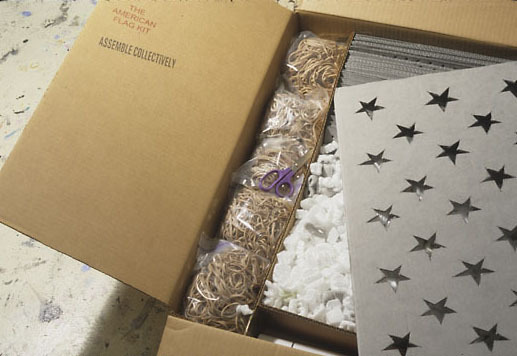 For this project a large American flag is constructed using gray archival cardboard and rubber bands. It is similar to the flags that are created with the kits. The design elements of the American flag are cut from the cardboard and assembled together with rubber bands. The flag is large in scale and its measurements are in agreement with the official measurements of the American flag. The flag is designed to hang in a vast public space such as Vanderbilt Hall in Grand Central Terminal or in the main lobby of the Willis Tower (the former Sears Tower) in Chicago. The flag will fall apart within a year as the rubber bands disintegrate. Each year a quorum is assembled to decide on how to reassemble the flag. The group might decide to assemble the flag in its traditional design or they might decide to assemble the flag in a new arrangement. All decisions regarding the flag’s design must be reached through the democratic process. The size of the quorum is determined by the amount of people inhabiting the location in which the flag is displayed. A fund is established to pay a crew to assemble the flag each year. This is an unrealized project.